(CNN) — Some patients who developed fungal meningitis in an outbreak linked to a Massachusetts compounding pharmacy are experiencing more health woes, officials said. Patients are not only developing meningitis, inflammation of the thin tissue surrounding the brain and spinal cord; some are also developing an epidural abscess, which is a collection of pus between the outer covering of the brain and spinal cord and the bones of the skull or spine. Meningitis is a known complication of an epidural abscess, but what’s puzzling some health experts is that some patients were first diagnosed with and treated for meningitis and then developed an abscess. “This is not typical for fungal disease,” says Dr. Tom Chiller, who serves as deputy chief of the CDC’s Mycotic (fungal) Diseases Branch. While he and other health officials have been hearing about epidural abscesses since the beginning of the outbreak, it is unclear how many patients have had the abscesses. The Centers for Disease Control and Prevention now lists meningitis, epidural abscess and stroke among the 395 cases of fungal infection; it also says nine people have suffered peripheral joint infections from New England Compounding Center products. 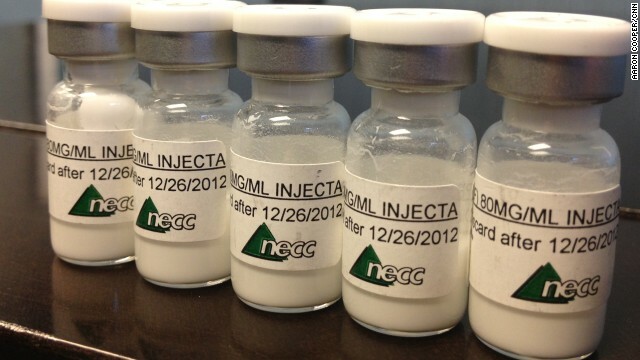 As of Monday, the total number of illnesses linked to tainted steroid injections produced by the NECC remains at 404, unchanged since Friday. However, one more person has died, bringing the total fatalities to 30. Abscesses are usually found using an MRI. Some meningitis patients underwent an MRI where no abscesses were found, and then two or three weeks later, another MRI detected an abscess after patients reported back pain. In Michigan, which has the most illnesses connected to the tainted NECC medications, nearly half of the patients have developed an abscess. As of Monday, the state health department is reporting a total of 119 cases — 61 cases of meningitis, 51 cases of epidural abscesses, six peripheral joint infections and one stroke. All seven of Michigan’s deaths were reported in meningitis patients. All of the epidural abscesses in Michigan were diagnosed before some patients developed meningitis, according to Angela Minicucci, spokeswoman for the Michigan Department of Community health. She says none of the Michigan cases developed meningitis first and abscesses later. Tennessee has the second-highest case count, with 79 cases and 12 deaths. However, health officials there have not yet tallied how many patients had epidural abscesses and when. The fungal infection cases are unprecedented, said the CDC’s Chiller, because usually fungal infections caused by black mold usually trigger sinusitis or skin infections — the fungus isn’t injected into the central nervous system with a steroid. “We’re learning as we go,” he says, adding that patients are presenting with illness in completely new ways. According to the CDC, symptoms have appeared between one and four weeks after an injection. Since the NECC products were recalled just about a month ago, one would think that window would be closing. But given that some patients are developing secondary infections such as abscesses and others are reporting symptoms after longer periods of time, Chiller says patients need to be vigilant for at least several months. Bottom line: If patients know they’ve been given injections from the three tainted lots of the preservative-free steroid methylprednisolone acetate (MPA) distributed by NECC, they need to see their doctor with any new symptoms or concerns. In the meantime, lawmakers are continuing to look for answers about how the outbreak occurred. On Monday, the House Energy and Commerce Committee announced that the Subcommittee on Oversight and Investigations will convene a hearing on November 14 to further investigate what went wrong at the NECC and why the company, which had a history of problems, was able to continue to function. Food and Drug Administration Commissioner Margaret Hamburg is scheduled to testify. James Coffey, director of Massachusetts Board of Registration in Pharmacy, and Barry Cadden, owner and director of the New England Compounding Center, have also been invited. This entry was posted in Uncategorized and tagged Farmington Hills chiropractor, fungal meningitis by tiptonchiro. Bookmark the permalink.